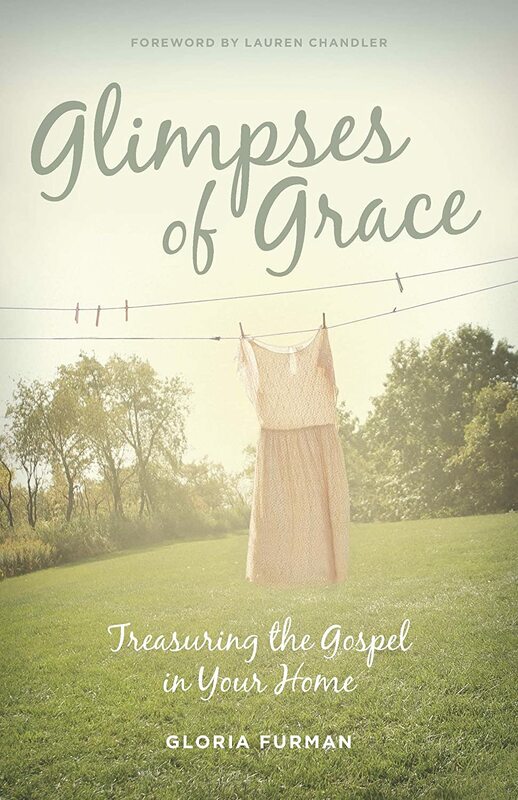 Today I will offer you not only a review of Gloria Furman's new book Glimpses of Grace, you also have a chance to win yourself a copy! Real Life Examples: The example Gloria provides in her first chapter hit right on something I had done less than 24-hours beforehand with my husband, getting all self-righteous and grumbly about an unrinsed dish! So I was hooked quickly. This pattern continued throughout the book. At one point I emailed her to say that I thought we might be the same person! But truthfully, the issue is that we're all sinners and Gloria is willing to look into situations (that really are really embarrassing when revealed) and free her readers by applying the Gospely to those messy places in the middle of the mundane. Which brings me to my next point. The Application of the Gospel: The best way for me to describe how Gloria writes is to say she's very "Pauline." This year our small group worked through Colossians and it is notable how Paul several times goes back to the basic Gospel (Christ!) as the foundation for and answer to everything. Everything. Gloria does that for us in Glimpses of Grace with respect to homemaking. The mundane might be repetitive and monotonous, but God's children have all they need for life and godliness in it. Our problem is when we focus on the mundane rather than the Lord. I have this quote from one of Gloria's blog posts on my kitchen cabinet: When the mundane looms larger than eternal life, we forget who God is, who we are, and who our children are. Gloria's new book reminds us not to let the mundane loom larger than eternal life! Length & Readability: Moms, I'll bet you're thinking, Good grief, when would I find time to read a book! So one quick note about that. The book is about 180 pages long. You could sit and read a chapter for about fifteen minutes a day and finish the book in a just a couple of weeks! We need to take a little time each day to recharge anyway, so why not fill your mind with the edifying words that Gloria has to share with us. Every time I sat to read a chapter this month I found that it had direct application to something going on in my life. I don't think this is simply because this book was "the right book at the right time." I think it's because Gloria simply, but skillfully and wisely, applies the Gospel to the life we live as homemakers. As is stated in the Forward, this is not a how-to. There are not seven easy steps to Christian perfection in homemaking. Gloria simply looks at life and discusses how we can apply the Gospel to the situations in which we find ourselves on a regular basis, not theoretically, but with examples from her own experience, whether it's relating to her husband, her children, sharing with others, working though times of intense hardship, etc. The only how-to Gloria offers is the Gospel - the good news that Jesus Christ lived, died, and rose again to save us from our sin and restore us to a right relationship with God. That is all she can offer, because the Gospel is the only source of life. By combining Gospel-truth with stories from the trenches, so to speak, your faith will be strengthened and you'll be encouraged to know you're not alone or crazy (have I mentioned how real her examples are)?! Gloria has a few small children and her husband, who pastors a church in Dubai, suffers from chronic pain that effects his ability to use his arms. Gloria knows the mundane, she knows hardship, and she knows Jesus. This is not a put-on-a-happy-face book. This is a real book, about real life and real, life-giving Truth. I hope it blesses and encourages you to seek the Lord as much as it has for me! I'm going to give one away on Monday! Simply, drop me a note in the comments to say "I want in!" And share this review on your Facebook page for a second entry (but please tell me so I know)! FYI: I received a pre-publication copy of this book in exchange for my review. So I want to pass on the one that I would have bought anyway to Monday's lucky winner! I want in! I also left a comment on your announcement post about Tyndale's Summer Reading Program. But now I need to set aside time to read! Hey Erica! How are you? I'm adding your name to the list! You totally got married recently, didn't you?! I thought I'd put in a comment earlier this week ... must have been my imagination. That happens a lot, lately, ha! Looks like a lovely book!